Explore the Withlacoochee River as it meanders thru the edge of Valdosta, past Shadrick Sink, Cherry Creek, and under North Valdosta Road, on the Withlacoochee and Little River Water Trail. Wave at some of your friends in the houses nearby. Update 2016-03-19: Yes, there are potholes at Staten Road Bridge, but that never stopped us from paddling. Come on down! Update 2016-03-14: Langdale Park will be closed, but VLPRA will let us in. Put in: Staten Road Bridge, 7.1 miles north of Valdosta, Lowndes County. Take out: Langdale Park Boat Ramp, 3781 N. Valdosta Rd., Valdosta, GA 31602, Lowndes County. Also passing: Bay Branch, Sermons Branch (if that is its real name), Withlacoochee Slough at Cherry Creek, Cherry Creek Sink, and Stillhouse Branch coming out of Valdosta Country Club. Directions from I-75: take exit 22, go east on North Valdosta Road, left on Perimeter Road, left on Oak Street, continue onto Staten Road, cross Orr Road, and after about 2/3 of a mile just before the bridge, turn off to the right. Too low: we’re guessing 2 feet on either the at Skipper Bridge or US 41 gauges. Too high: flood stage is 15 feet at Skipper Bridge and at US 41. 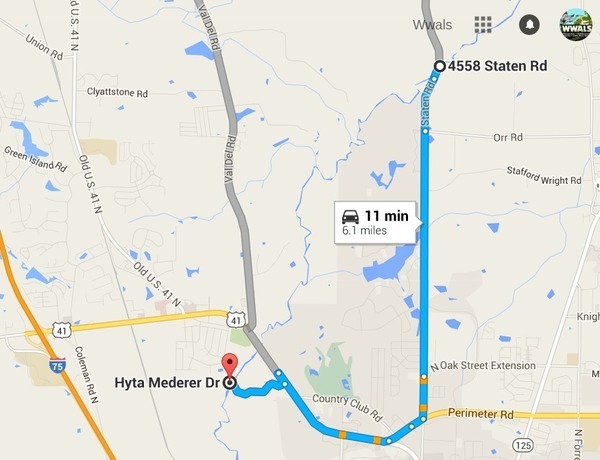 Directions: From Valdosta, north on Bemis Road (GA 125) to Ray City, right on Jones St. to boat ramp. 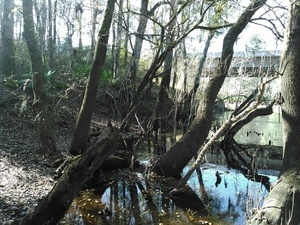 This entry was posted in Blueway, Outing, River and tagged Bay Branch, Blueway, Cherry Creek, conservation, Georgia, Langdale Park, Lowndes County, north Florida, North Valdosta Road, Outing, river, Sermons Branch, Shadrick Sink, south Georgia, Staten Road, Stillhouse Branch, US 41 N, Valdosta, watershed, Withlacoochee River, WWALS, WWALS Watershed Coalition on January 8, 2016 by jsq.